Ajmer Dargah -The 13th-century dargah has been included among the Swachh Iconic Places, a clean-up initiative focused on iconic heritage, spiritual and cultural places through a multi-stakeholder approach model. The campaign was initiated under the Swachh Bharat Abhiyan in 2016. In Ajmer, the Collector will act as the project’s nodal agency with the Dargah Committee and ‘khadims’ (workers) being the primary stakeholders. An amount of ₹5.68 crore will be invested in the project’s first phase for establishment of two flower compost making machines, cleaning and basic repair of the Jhalra pond, re-flooring in select areas, procurement of machines for cleaning the floors, risk management system plan, conservation of Shahjahani Gate and initial plans for Nizam Gate. The MoU was signed in Ajmer on Saturday in the presence of Union Minister for Minority Affairs Mukhtar Abbas Naqvi. Mr. Naqvi said the project would help in the dargah’s upkeep and provide more facilities to the pilgrims coming during the Urs and in other seasons. The Motor Vehicles (Amendment) Bill, 2017 has been heralded as a measure to reduce road accidents. But, except the provisions for higher penalty for drivers and operators, there is no mention of any other measures to prevent accidents. The proposed amendment is harsh on drivers, truckers and small players, without addressing the causes of accidents. According to a study only 10 per cent of the accidents occur due to the drivers’ fault. Long duty hours, stress and strain on the drivers, particularly, the truck drivers are also contributory factors. However, these facts were not considered while its formulation. Factors such as traffic discipline, over-congestion, growing number of vehicles beyond the capacity of roads have not been addressed in the Bill. There seems to be a hidden agenda behind this Bill which becomes clear if one studies its other provisions — to regulate and privatise the regulatory mechanism, right from registration of vehicles to inspection, through concentration of all powers with the Centre in the name of simplification and promoting competition. State Transport Undertakings (STUs) record the lowest accident rates in the country. But Motor Vehicle Bill is going to badly hit these STUs. Sections 66, 66A, 66B, 67, 72, 74, 88A, 92, 94 and 96 go against the interests of STUs. The new Section 66A would deprive the State Governments from formulating schemes and also granting permits. So, it is anti-Constitutional and encroaches upon the powers of States. 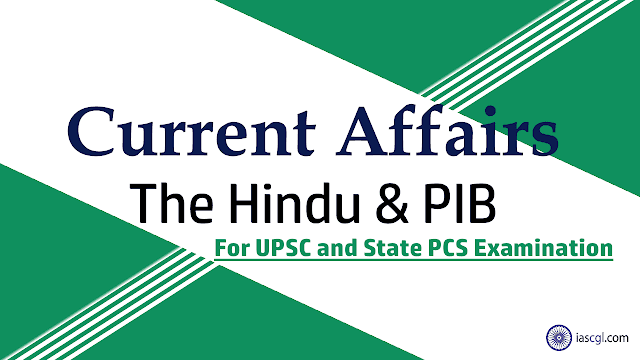 The Bill will lead to closure of STUs and retrenchment of lakhs of employees. These aggregators are also a threat to auto rickshaws drivers, many of whom are self-employed. The Bill lays down that branded company spares are to be used, which will drive small enterprises in automobile spares and their dealers out of business. What can really help to reduce accidents. Segregation of roads and rectification of defects in the construction of roads. Incorporation of road safety and traffic rules in the school curriculum from 5th Standard to 12th Standard. Drone regulations:how, where Indians can fly ? Civil aviation regulator DGCA this week published final guidelines for operating drones or remotely piloted aircraft systems by ordinary citizens. The guidelines come into effect on December 1, the date when the civilian use of drones becomes legal in India, subject to various requirements and clearances. Every drone bigger than Nano must obtain a unique identification number (UIN) from the aviation regulator (similar to the registration number for a car), which must be displayed on the aircraft. A UIN will be issued once, against a fee of Rs 1,000, and will not be issued to a foreign citizen or entity. Users of bigger drones will be required to obtain a Unique Air Operator’s Permit (UAOP), similar to a driver’s licence. The permit will cost Rs 25,000 and will be valid for five years. ₹10,000/- The UIN and UAOP can be obtained from the online platform Digital Sky that will go live on December 1. Conditions to fly a drone. All drones other than those in the Nano category must meet mandatory equipment requirements such as GPS, anti-collision light, ID plate, radio-frequency identification (RFID) and SIM facilities with software that ensures ‘no-permission, no-takeoff’, among other features. Before flying a Small or bigger drone, an operator has to file a flight plan, and inform the local police, so that the machine can reach a height of 400 ft or more, and use both controlled and uncontrolled airspace. Micro drones will be required to submit a flight plan only if using controlled airspace; the operator must, however, inform the local police in all cases. All categories of drones must be flown in the visual line of sight, and only during daytime. On a strongly and soaring demand for generic drugs, India’s pharmaceutical producers emerged as world market leaders in pharmaceutical sector and were a major business success story in the 2000s. In the whole process, Indian producers made a valuable contribution to reducing costs and to expanding access to life-saving treatments for patients, both in emerging markets and in developed countries. Now globally, and especially in developed countries, waves of consolidation among pharma retailers stiffer competition from Chinese pharma manufacturers and an uptick in generic drug applications have combined to put downward pressure on drug prices. India’s stock market has reacted quite negatively to these developments, wiping nearly 20% off the value of Indian pharma stocks between August 2016 and August 2018. Given these adverse headwinds, it is imperative that India’s pharmaceutical manufacturers create new markets to restore market confidence in their growth prospects. It is increasingly clear that the segment of the pharmaceutical market where we will see demand grow the fastest in the coming years is products that treat non-communicable diseases. We should, therefore, strive to promote strong, indigenous producers of complex generics and biosimilars as this has enormous potential to improve public health in emerging markets. 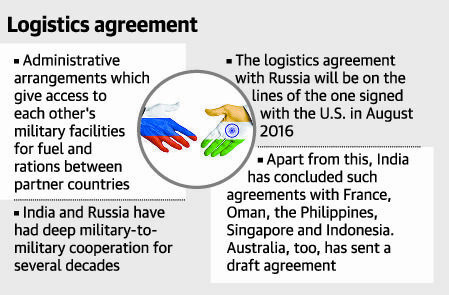 India and Russia are working on fine-tuning a logistics agreement which will be ready to be signed during the annual summit between Prime Minister Narendra Modi and Russian President Vladimir Putin. The proposed agreement is similar to the ones India has signed with other countries, including the US and France. The two leaders will sign the agreement in October. What is Logistics Agreement ? Under a logistics agreement, military facilities in partner countries can be used for refuelling of aircraft and ships, repair, maintenance, replenishment of provisions and as resting and transit points for soldiers. This increases turnaround time and also saves on costs when operating far from own borders. The idea behind the agreement is to increase operational flexibility and as Russia is India's long-term partner, it is prudent to have such an agreement in place. In August 2016, India signed Logistics Exchange Memorandum of Understanding (LEMOA) with the US after a decade of consultations. Since then, India has signed similar agreements with France, Oman, Philippines, Singapore and Indonesia to use the Sabang port. Australia is also keen to have a similar logistics facility in place with India and has sent a draft agreement. The Bay of Bengal Initiative for Multi-Sectoral Technical and Economic Cooperation (BIMSTEC) summit recently held in Kathmandu, Nepal, was marked by scepticism and hope. BIMSTEC: The Bay of Bengal Initiative for Multi-Sectoral Technical and Economic Cooperation (BIMSTEC) is a regional organization comprising seven Member States lying in the littoral and adjacent areas of the Bay of Bengal constituting a contiguous regional unity. BIMSTEC comprises of India, Bangladesh, Myanmar, Sri Lanka, Thailand, Bhutan and Nepal. The fourth summit of the BIMSTEC was attended by leaders of the seven nations of the grouping. The positive side, the fact that the summit could be held was a success in itself. A Several important decisions have been taken. First, work begins now on drafting a charter for BIMSTEC, which has functioned so far on the basis of the Bangkok Declaration of 1997, and outcomes of the past three summits and the Leaders’ Retreat in 2016. Second, a Permanent Working Committee will be set up to provide direction during the period between two summits and also to prepare the Rules of Procedure. Third, the Secretariat has been promised additional financial and human resources and enhancement of its role to coordinate, monitor and facilitate the grouping’s activities. Fourth, as the institution has been handicapped due to lack of financial muscle, the leaders took the bold decision to establish the BIMSTEC Development Fund. This is not an easy task, but without strengthening itself financially, BIMSTEC cannot shed the unwanted tag of being a mere talk shop. Fifth, a push to increase its visibility and stature in the international fora will also be made. Finally, recognising that 16 areas of cooperation represent too wide a spectrum, the BIMSTEC governments will make a serious endeavour to review, restructure and rationalise various sectors, identifying a few core areas. In this exercise, Thailand has proposed a new strategy of five pillars (viz. connectivity, trade and investment, people-to-people contacts, security, and science and technology). This will be considered, although the difficulty in dropping specific sectors dear to individual member-states should not be minimised. The BIMSTEC Region is a meeting point for India’s Neighbourhood First, and Act East policies. It offers opportunities for connectivity covering trade, economy, transport, digital and people-to-people. Indian PM thus made a strong pitch for enhanced regional connectivity. India also expressed its commitment to working with the members on combating terrorism and drug trafficking. BIMSTEC member states are largely situated between the Himalayas and the Bay of Bengal. They hence face frequent natural disasters such as flood, cyclone and earthquake. India thus called for “cooperation and coordination” in humanitarian assistance and disaster relief efforts. India will also host the International Buddhist Conclave in 2020. The BIMSTEC leaders were invited to attend the event as guests of honour. India expressed its commitment to enhance its national knowledge network. This was in reference to the field of digital connectivity in Sri Lanka, Bangladesh, Bhutan and Nepal. India also plans to extend it to Myanmar and Thailand. India would set up a Centre for Bay of Bengal Studies at the Nalanda University. This is to promote research on art, culture and other subjects in the Bay of Bengal.